For those of you not my accomplices, the three of us spent a very relaxing and yet fabric/trim- filled weekend together. We decided (rather at the last minute) to have a weekend of girliness, fabric sales, good food and just a *little* wine and karaoke thrown in for giggles. It was wonderful to finally be able to talk about design concepts in person (and with fabric swatches on hand, I might add). Sipping some great gourmet teas (from adagio.com--see button on left to get a coupon--shameless plug), and munching on strawberries and fancy pants chocolates seemed to complete the decadence of a weekend already dominated by decadent fabrics from various local vendors. The weekend got me psyched to sew again, which I'd been kinda putting off recently. Now I'm definitely feeling more motivated. I was also extremely happy that the fabric store sales I promised did not leave my dear accomplices empty handed...that would have been not quite as fun, though I think we would've enjoyed ourselves with or without fabric purchases. After all, just looking and getting ideas is entertaining... But purchases are damn satisfying. Chuckle. 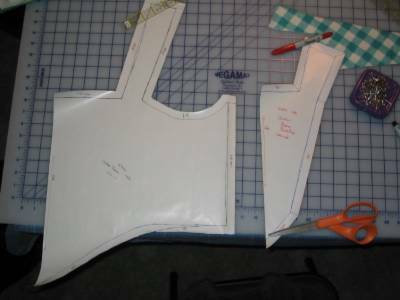 A big bonus of our time together(for me at least) was that I had my bodice roughdraft pattern pinned up to fit me properly, and now I'm drafting the "final" pattern--thank you so much for your patience in helping me out with that, girls--especially Beth!! Hopefully, this means that in the next few days I will get a move on cutting out some bodice bits for my practice dress, and perhaps even *gasp* do some sewing! Many thanks to the gracious hostess! What Julie failes to mention is that she provided gourmet meals three times a day. How lovely. I am sad that we didn't take a picture of the Dorothy-goes-to-the-renfaire bodice mock-up. *That* was pictureworthy. Good Gurgi. 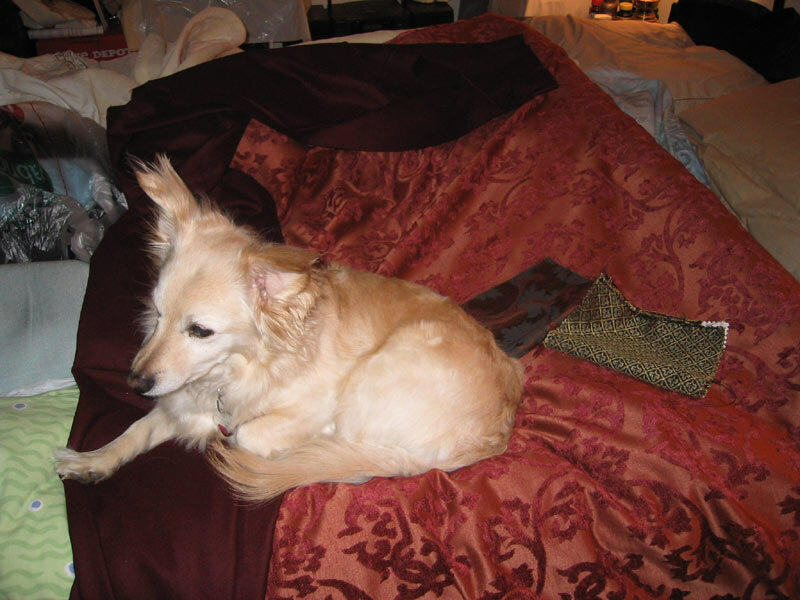 Tribble has already put his furry behind upon my nice new ribbons.